Ya Jagoff!!! | Jagoff-Proof gadgetry.. Game On! Who will win a tech tailgate visit? Jagoff-Proof gadgetry.. Game On! Who will win a tech tailgate visit? 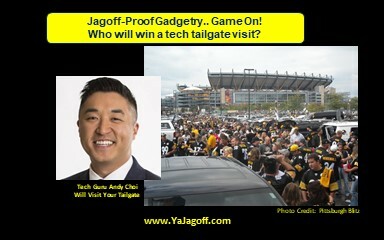 Hey.. Andy Choi, Verizon’s “Tech Guru” is coming to Pittsburgh, next weekend, looking to visit someone’s Steelers tailgate. Do you have these kind of Jagoffs at your tailgate? A Jagoff whose phone always dies and wants to borrow your charger. A Jagoff who always walks in front of the special portable TV you have set up. A Jagoff who has dropped their phone so many times that the cracked screen looks like a spider web? Andy has stuff to help that! The YaJagoff Crew and Andy are going to visit someone’s tailgate next Sunday! And Andy will bring his tech toys to up your tailgate game! You can’t keep them but we will make some fun videos! Moto Z3 along with Insta-Share Projector Mod and Amazon Alexa Mod: The projector mod is perfect for showcasing the game on the big screen without the hassle of lugging around any unnecessary equipment. And have Alexa help you enjoy and prepare for the big game with updates on scores, highlights and weather forecasts (you just may need a jacket!). Mophie Powerstation Plus XL: Power on the go so you never run low on battery life. Belkin Road Rockstar: Your tailgating buddies also need power? No problem. The Belkin Rockstar’s four-port charger allows all of your friends to plug in for power on the go. Under Armour Protect Grip Case: Protect your phone from spills and drops while cheering on your favorite team. UE Wonderboom: Broadcast the game with high-quality sound. Also very durable! You can fumble this speaker without penalty. Tile 2-Sport: Keeps track of your backpack, wallet and cooler at all times. We will pick one tailgate to show Andy how we do things here in Pittsburgh! NOTE: You can’t keep Andy’s stuff OR Andy.. but we will make a fun video with YOUR GROUP and Andy! Previous articleWho Is the Jagoff Blocking Grandview Avenue on a Friday?